We make small 3-inch hamburger buns with this recipe, but you can make any size you like. 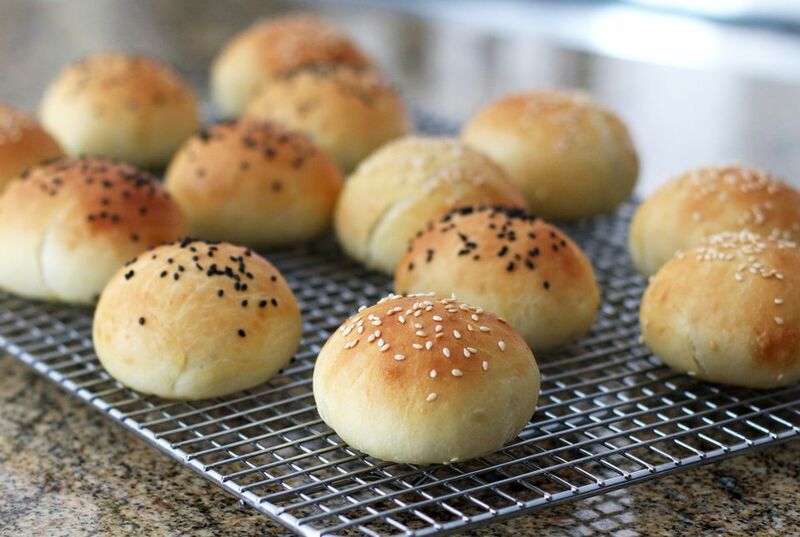 Before baking, brush the buns with an egg wash and sprinkle sesame seeds or poppy seeds over the tops. We recommend the egg wash because it keeps the crust soft while giving the tops some nice shine and color. Serve these great-tasting homemade buns with pulled pork, burgers, beef barbecue, chicken salad, or other sandwich fillings. In a 2-cup measure or small bowl, combine the warm water and milk. Stir in the yeast and sugar and let stand for 4 to 5 minutes. In a mixing bowl, combine the bread flour and all-purpose flour with the salt, whisking to blend thoroughly. Add the pieces of butter and work them in with a pastry blender or fingers until the mixture is crumbly. In another bowl, beat 1 egg. Add the beaten egg to the flour mixture along with the yeast mixture. Stir until moistened. Remove the dough to a floured surface and knead for 8 to 10 minutes, adding more flour if needed. You want the dough to be soft but not too sticky to handle. Alternatively, you may use a stand mixer with a dough hook to knead the dough. Shape the dough into a ball and put in a large buttered bowl. Turn the dough so it is buttered all over. Cover the bowl with plastic wrap and let stand in a warm, draft-free place until doubled about 1 1/2 hours. Divide the dough into about 12 to 14 portions around 2 ounces each and shape into balls. Arrange on parchment-lined baking sheets about 2 inches apart. Cover loosely with a clean dish towel or plastic wrap and let rise in a warm, draft-free place for about 1 hour. Place a pan on the oven floor and fill with about an inch of hot water. Preheat the oven to 400 F.
Before baking, brush the buns with the beaten egg and water mixture. Sprinkle with sesame seeds or poppy seeds, if desired. To serve, cut the buns in half horizontally and toast them lightly if desired. Serve with burgers, pulled pork, beef barbecue, sloppy Joes, or other sandwich fillings.